Designing a table scape is not only left for the professionals. Entertaining at home is a celebrated past time and there are simple tips to elevate the settings around your own dinner table. 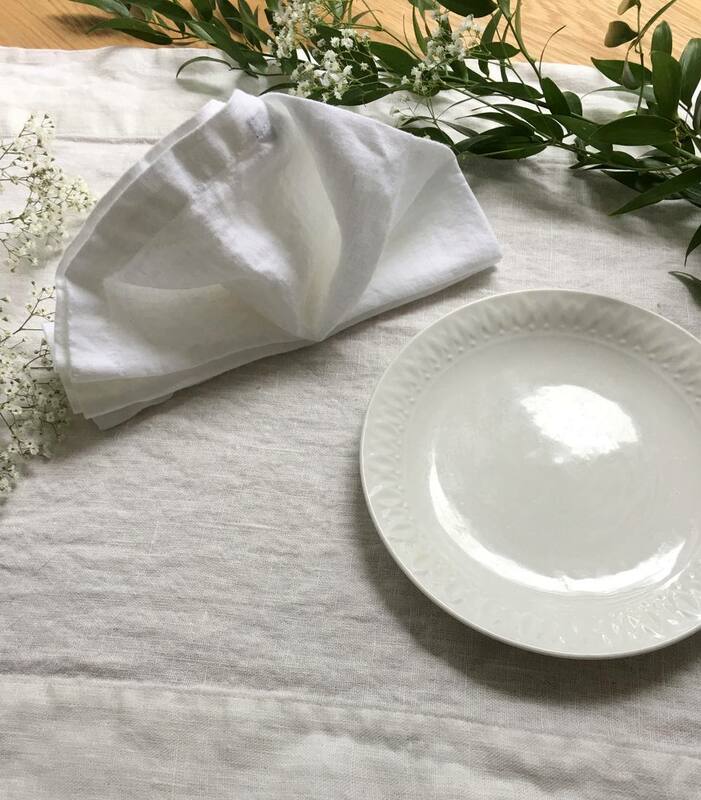 To start, folding cloth napkins in a decorative fashion creates a foundation for laying table decor to make a statement. After the serve ware is placed in it's position and before the food is served it's time to consider the options of presenting your napkins at the table. Often times used at luxury restaurants a standing fan fold is great for gatherings at your home or if you are interested in elevating a rented or temporary space. Here are 7 simple steps to your best standing fan fold. Find a flat surface to begin your work. Lay your napkin face down and smooth out wrinkles. Depending on the look of your table you have the choose to fold your napkins au natural or give them a quick steaming before use. If you are having a casual outdoor dinner party I would suggest using napkins as they are and avoiding the hassle. For an intricate fold like the standing fan fold a good steaming with accentuate your handy work in setting the table. Align your seams and fold the napkin in half lengthwise, again taking a moment to smooth out any bumps. Begin a series of narrow, long accordion shaped folds starting from the bottom edge of the napkin. Your first fold should be under about two inches and then the reverse to up 2 inches and continue to repeat. An important thing to note is making sure each fold is even so each fold alights with the last one. Remember to smooth after every fold. This is repeated until you reach close to four or five inches to the top, that section should be left unfolded. With care turn your napkin over so you can see the folds are now safely underneath. You should be looking at a smooth rectangle in a horizontal position. Note that the folds you've took time to create should still run across the bottom horizontally. One more moment to smooth out the wrinkles. Take hold of the right side of your napkin gently to ensure your accordion folds stay in tack and fold the napkin in half lengthwise one more time but this time to the left. To have your folds running vertically along the left edge of your work turn your napkin about one-quarter clockwise. The top right corner of your creation should be folded down towards your intricate accordion area so you can see a triangle shape. That corner should be tucked into the center of the folds for safe keeping. Take time to align the edges of all seams so your triangle is even. The tip of the triangle should be facing away from you and the napkins seams will be at the base of the triangle. In a vertical position the fan should appear closed. With a gentle touch open your accordion folds to reveal a fan shape. The triangle you've created will act as a kickstand to keep your fan standing up.